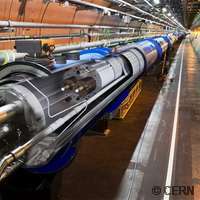 An international team of experts are developing a revolutionary laser system by investigating the use of fibre lasers in ground-breaking particle accelerator technologies, such as the Large Hadron Collider (LHC), which is considered by scientists as one of the great engineering milestones of mankind. The ICAN ('International Coherent Amplification Network') project, which has received EU-funding of half a million euros, is a novel laser concept for high- energy particle acceleration. ICAN team members include experts in optical science, technology and industry, astronomy and manufacturing. Four renowned laboratories are also involved: ORC at the University of Southampton, UK; École Polytechnique, France The Fraunhofer Institute for Applied Optics and Precision Engineering (Fraunhofer IOF) Germany; and CERN, the European Organisation for Nuclear Research, Switzerland (and home to the LHC). It also involves a large number of worldwide partners from the laser, fibre and high-energy physics communities and industry. Together they will set out a new laser system composed of massive arrays of thousands of fibre lasers, for both fundamental research at laboratories and more applied tasks, such as proton therapy and nuclear transmutation. Lasers can provide, in a very short time (measured in femtoseconds), bursts of energy, and equivalent to a thousand times the power of all the power plants in the world. One significant societal application of such a source is to transmute the waste products of nuclear reactors, which at present have half-lives of hundreds of thousands of years, into materials with much shorter lives (down to tens of years). This would dramatically transform the problem of nuclear waste management. This gets my vote for most uninformative article of the day. What's so uninformative about it? They want to use lasers instead of accelerators to push particles to very high speeds. How this is going to transmute nuclear waste (without consuming vastly more power in the process than the spent fuel rods produced in the first place - i.e. in a way that actually makes sense) is a bit of a poser, though. which at present have half-lives of hundreds of thousands of years, into materials with much shorter lives (down to tens of years). But which would also mean that the stuff becomes a lot more radioactive - i.e. even more difficult and dangerous to store.